An allergy scare taught me a valuable lesson this summer. I count myself so lucky because Jack doesn’t have any known allergies. Our best friend’s young daughter, Lily, 6, has severe allergies to peanuts and bees. If exposed, she’ll go into Anaphylactic shock (God Forbid) and need an injection from an EPI pen before going directly to the ER. It’s so scary! I truly feel for my friends who have this on their minds when Lily is at school or a b-day party—or anywhere without them, because even though there’s an action plan with everyone, accidents happen. Cringe. And an accident happened to us. I recently blogged about our awesome (and emotional) trip down the Jersey Shore this past weekend. But then we got home and I noticed two pink marks on Jack’s arm. I didn’t panic. They looked like mosquito bites. Eh! I slapped some Benadryl cream on ’em and tucked him to bed. The next morning they were still there and Jack was complaining they were itchy and “pinchy.” Strange. I applied more cream and gave him some oral allergy meds, too. He stopped complaining and the day moved on. After dinner we set out with Lucy, our new Golden Retriever puppy, (the cutest and sweetest) for her nightly mile-long walk where she examines every blade of grass and rolls down hills. It was a gorgeous night—cool breeze, bright sky, and clouds that looked like dragons and a Queen’s royal throne, according to Jack. Five minutes into our walk, Jack started crying, dropped to the sidewalk, and yanked his Croc off. “Something is pricking my foot! It’s so itchy.” These were real tears so I knew he wasn’t BS’ing me. Then with closer inspection, I noticed his entire body: feet, legs, arms, face, and back was covered with welts. I dragged Jack and Lucy into the condo, shoved Benadryl meltaways into his mouth, and drove to the ER. I had no idea what the hell was happening. My kid doesn’t have known food or medication allergies. He hadn’t had any new food or meds that day. Was this a delayed reaction to Lucy? Oh no! I remained shockingly calm, for me. Normally I panic, but come to think of it, when it comes to Jack, I do often stay cool as a cucumber because I’m the only parent. He relies on ME. My job is many things and I take protector seriously. We were fast-tracked to a room because of the visible welts. The nurse looked in his throat, nose, and ears and assured me his airway was fine. He also told me the bumps were not Chicken Pox, mosquito bites, or ew, Scabies. He told Jack to rest on the bed and put a cold compress on his head. As much as I told Jack not to itch, he did and he squirmed and shrieked in pain—the worst. Seconds later, the doc came in. He asked me what we’d been up to the past couple of days. When I told him we’d been at the beach, he asked if Jack was a “play-in-the-sand” kid. Oh yes, I said. Jack, like, rolls in the sand. 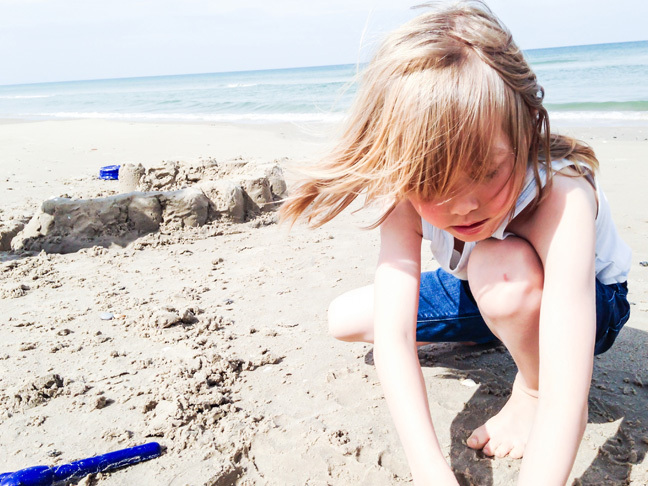 Loves to build castles and dig holes in search of sand crabs. When he finds them, he brings the little guys over to me with great enthusiasm: “LOOK MOMMY! THIS IS JOE!” Then he pops them in a beach bucket with water and sand. After this reveal, the doc told me that sand crabs are also known as sand fleas or mole crabs—and that Jack was exhibiting sand flea bites and a reaction to the bites. Ew. I started scratching. “No, they’re not contagious,” he explained. “This isn’t like lice.” The doc, ordered a shot of steroids and more oral Benadryl. While we waited, I Googled “sand flea.” This image came up. Yep! Exactly what Jack had in his hand—same size too! The shot was as dramatic as you’d expect, but the tears subsided and within 20 minutes the pain was gone and the welts were tamed. Jack wanted pizza and lemonade, so we stopped on the way home before getting an RX for five days of oral steroids filled. Such a fluke, right? But, I learned a good lesson. The doc told me I was 100 percent right to rush to the ER. The welts did not enter his throat, nose, or ears—but they could have. Have you ever had a scary experience with allergies or some mysterious ailment? How To Make Padsicles For Postpartum HealingHow Much Sleep Do Kids Need? Here’s A Guide By Age.